Cute door stop Autumn by Qualy Design Studio. Red color. Top design awards winner. This wedge door stop looks as if if brought directly under the door by autumn wind. 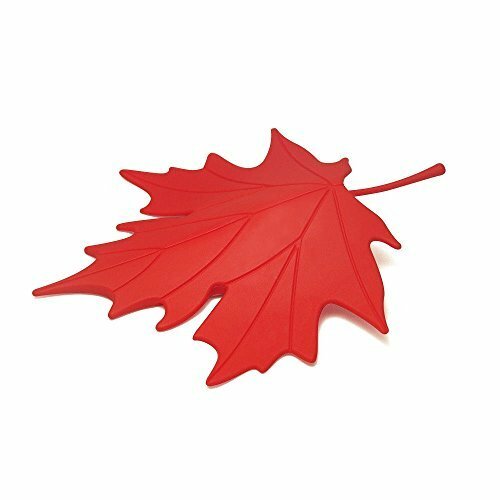 Autumn leaf door stoppers are available in green, brown, black, orange, red warm colors, which will not allow you to become sad on autumn day and bring serene and sunny day in your home. What are you backing with the door at home or in the office? Chair? Sneaker? Maybe a piece of paper, folded several times? We offer you a completely new and stylish solution to this problem - cute door stop Autumn by Qualy Design! Leaf wedge door stop looks completely natural, as if it had just fallen from the tree straight to your door. Very convenient and practical home decor gift or house warming present. This is a very practical thing for the house. In the middle of the leaf it's slightly elevated, due to this it holds the door. Qualy is one of the most creative design brands in Thailand. Products designed by Qualy are well known in Europe, USA, Japan, Australia and other countries around the globe. Design is the hallmark of Qualy brand! If you have any questions about this product by Qualy, contact us by completing and submitting the form below. If you are looking for a specif part number, please include it with your message.